Today I’m sharing a video review of my new favorite nonfiction picture book, FLUTTER & HUM: ANIMAL POEMS! The book is written in alternating English and Spanish poems and I’ve done my best to read in both languages. I am absolutely not a fluent Spanish speaker, but I love reading it aloud in small poetic chunks. I think it is important to celebrate language and to be brave about making mistakes, especially when I’m teaching young English learners. Have fun listening to FLUTTER & HUM! This month I’m spotlighting Marvelous Cornelius, the creation of Phil Bildner and John Parra, with a book giveaway! I love how the book joyfully celebrates the life of an extraordinary garbage man, working in New Orleans during Hurricane Katrina. My son thought that Cornelius–the singing, dancing, and hooting garbage man–looked like a giant on the cover, which I think must have been intentional. I told him that anyone can seem like a giant if you look at them closely enough and it’s true. This is a wonderful story about an everyday hero who came to New Orleans’ rescue in its darkest hour, just by being himself! Usually for a blog post I interview the artist or author, but Dionna Mann just hosted the most amazing six day blog party for Marvelous Cornelius, so I’m going to point you in that direction! When you are done reading all her marvelous interviews I know you will want to click the link below and enter to win one copy of Marvelous Cornelius, signed by the artist, on goodreads! 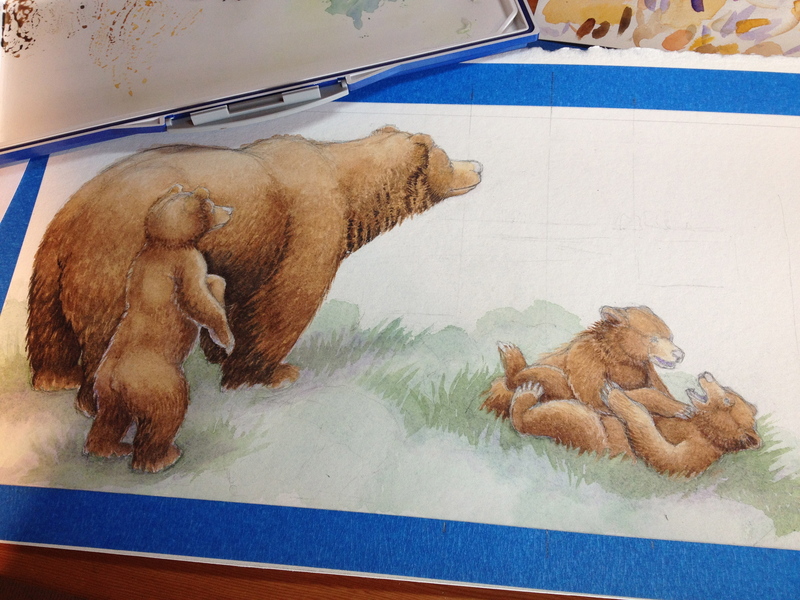 Today I’m interviewing Laurie Allen Klein, illustrator of THEY JUST KNOW, ANIMAL INSTINCTS. Her new book explores how some young animals just know what to do without any help. 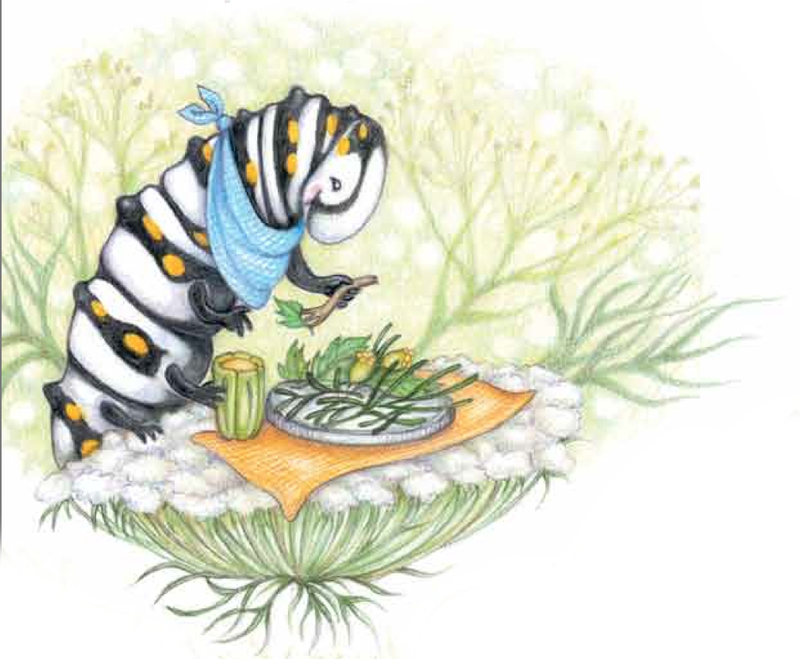 The book has all sorts of fun indulging the way kids THINK animals grow up… before setting them beautifully straight. And like all Arbordale books, the For Creative Minds section at the end of the book contains printable activities on animal instincts, learned behaviors, life cycles, and metamorphosis! You can enter to win a copy of your own on Goodreads by clicking the book’s cover below! Hi Laurie, it’s so exciting to interview you for the Nonfiction Nook! Usually when interviewing illustrators, I try to be a little more professional and removed, but since YOUR book is OUR book I feel like doing a little dance. The very first work of yours for the book I got to see was the fully sketched dummy as a pdf, and I was so pleased and excited. The way you go back and forth between humorous anthropomorphic and beautiful realistic spreads was EXACTLY what I had envisioned. Now, we never chatted while the book was being created, I never said (even to our editor), I want one spread to look like this and another to look like that, which is a fact nervous authors out there might appreciate. So, I wonder, how and when did you decide to give the book that visual rhythm? Interestingly enough, when I first read the manuscript I had a whole different idea in mind, but to be fair, it was a real quick read. I was in the midst of finishing another book when I got the e-mail from Arbordale asking if I would be interested in illustrating your story, so I read it through to get the gist of the narrative and subject matter. The Basic theme was right up my alley in terms of subject matter so I quickly said yes, and then turned my attention back to the illustrations for the other book. 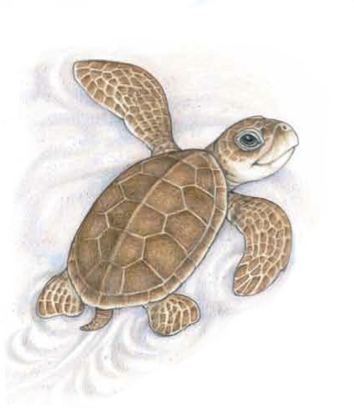 I knew, from that first quick read, that the book was naturalistic, depicting the different stages of development, and because most of the animals were relatively small (certainly their earliest phases were) I pictured the spreads being extreme close-up, with lots of realistic detail of each stage, while the background would be kind of blurry and out of focus. So that was the basic idea I had in mind, and the direction I intended to take. Fast forward to several weeks later. I was giving a Book Talk to a 4th grade class. On this particular day I was showing the class the illustrations for the book I had just finished, but I happened to take your manuscript with me because I thought the kids might find it interesting to hear the story, without any art yet, and follow me through the entire illustration process from Start to Finish, Words to Pictures. After we finished talking about the finished color illustrations for the previous book I read They Just Know to the class, suggesting they listen to the words and see what kinds of images came to their minds. Now I need to stress – I hadn’t read the manuscript since that first day I got the e-mail, and beyond imagining a series of extreme natural/realistic close-ups I hadn’t had the opportunity to think about the book, so this was only the second time I’d actually read the words with any real concentration. Plus, I was reading to a class of 4th graders. 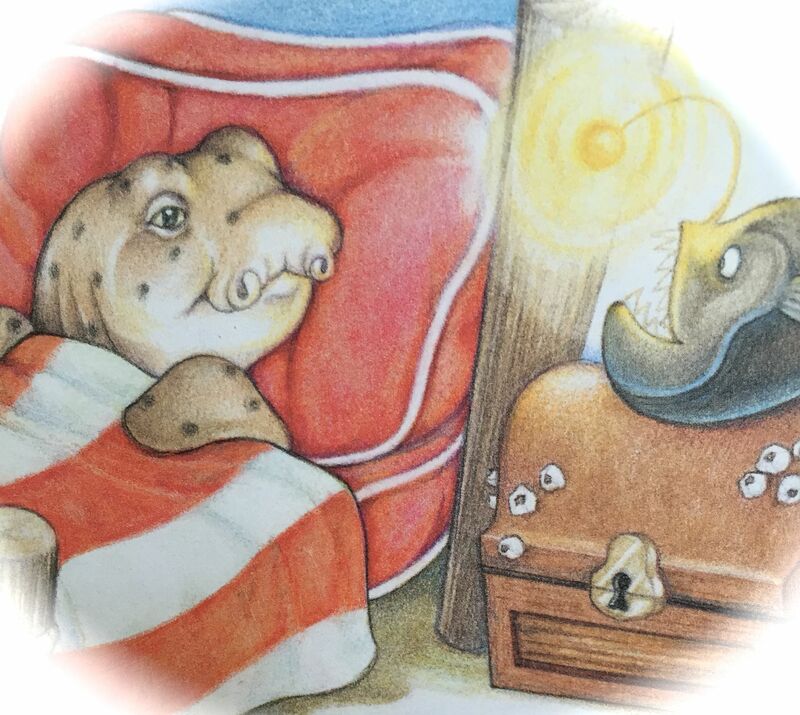 I’m sure I would have realized the anthropomorphic elements on my own when I sat down to seriously start work on the book, but I think reading the story aloud, to a class of elementary school students, really brought the anthropomorphic quality home. I suddenly noticed the funny comparisons between human children and their animal counterparts and I was stunned! It really took me by surprise, but even while I was reading, the creative gears were turning and a whole new visual direction began to materialize. It was truly a “Eureka!” moment. I read the story more closely then, and saw the distinct separation between anthropomorphic wording and the natural descriptions so I decided I would keep my realistic close-up approach for the nature-based passages but take a more humorous approach with the anthropomorphic sections. I grew up with Disney movies and my favorite children’s books have always been the ones where animals act like people, so this book gave me the chance to share all my childhood influences. 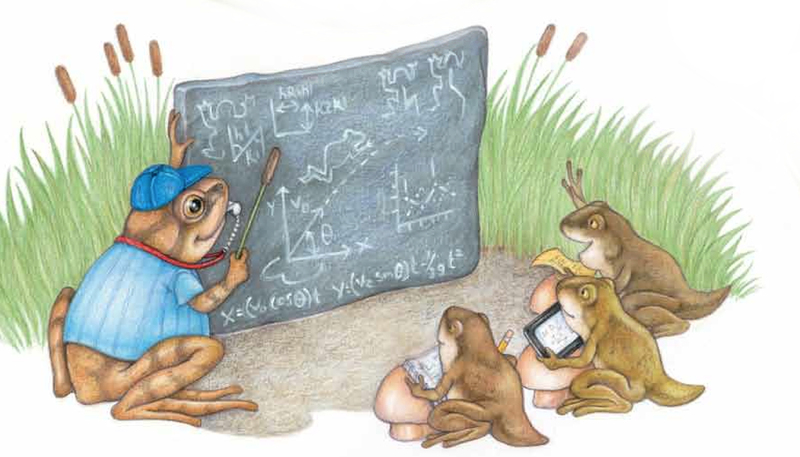 In some of the illustrations (especially on the funny spreads) there are sneakily hidden animal facts, things you would only know to include if you did a BUNCH of your own research. Do you do this to make the work fun for yourself, to make the book fun for kids… or both? First and foremost, and the thing I like to stress at every Book Talk and School Presentation is – I absolutely love, love, LOVE doing research! I enjoy looking up facts and reference pictures, the more information I discover the more I can put into an illustration. And looking up information on one subject inevitably leads you to new, unexpected connections which—again—serve to make an illustration more visually rich and interesting. For me it helps take the story, and the illustrations, to a different level. The reader may not notice anything the first time, but my hope is that every time the story is read again new things will be discovered. And I like to be as factual as possible. 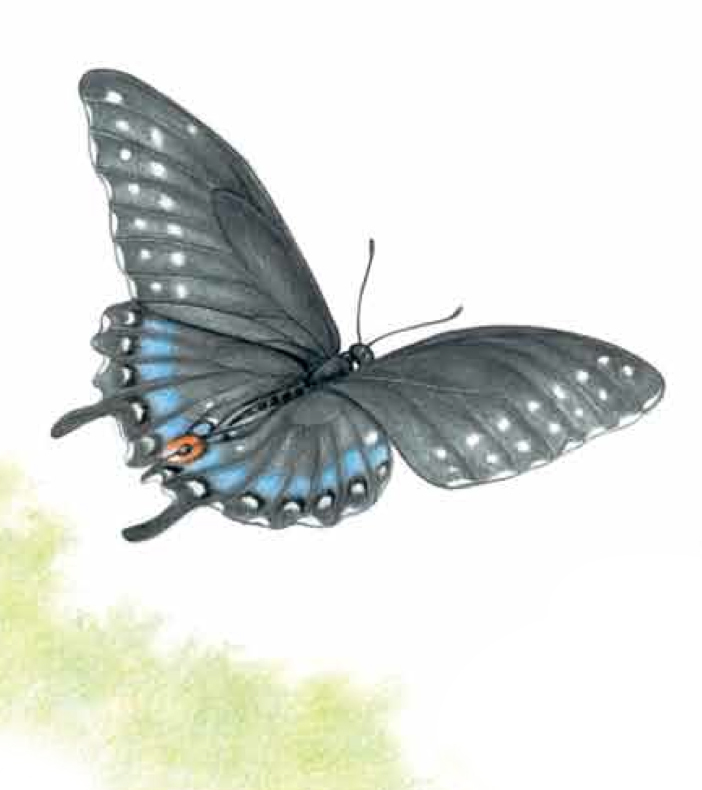 For example, in TJK, the first page describes a butterfly but doesn’t indicate what type of butterfly it is. I could have just made up a generic sort of cartoony butterfly, but since I had to draw one anyway why not make it a real one. I purposely chose an Eastern Black Swallowtail because I liked the way the caterpillar and chrysalis looked. Also, all the plants and flowers shown in the pictures are the kinds of Host Plants and Nectar Plants Eastern Black Swallowtails use. So, what are some of the favorite things you learned and included in the illustrations? Oh there are lots of things. I had particular fun with the new butterfly learning to fly because my husband is a pilot, and our daughter took flying lessons, so all those books and charts are based on the things they both used in their training. On the Horn Shark page I purposely showed the type of food Horn Sharks eat. And I think one of my favorite images is the Angler Fish serving as a nightlight. 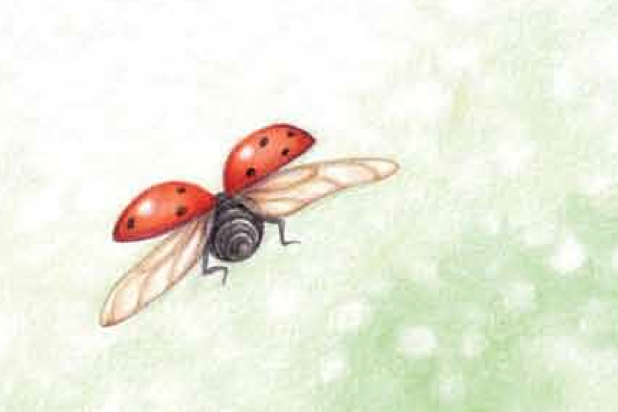 For the Ladybug pages – I had no idea a Ladybug goes through so many stages! Illustrator trick short cut – I colored all the stages on the naturalistic page first, then made color copies of the ones I needed, cut them out, and glued them directly onto the leaf-bulletin board art on the anthropomorphic page so each stage would look exactly the same on both spreads. Also I’m particularly fond of the look on the Mom Snake’s face (with her angry tapping “foot”) and the expressions on the two kid snakes. SIDE NOTE: Did you notice they were playing Snakes and Ladders. Ha! Yes, indeed I did! Laurie, do you have any questions for me? 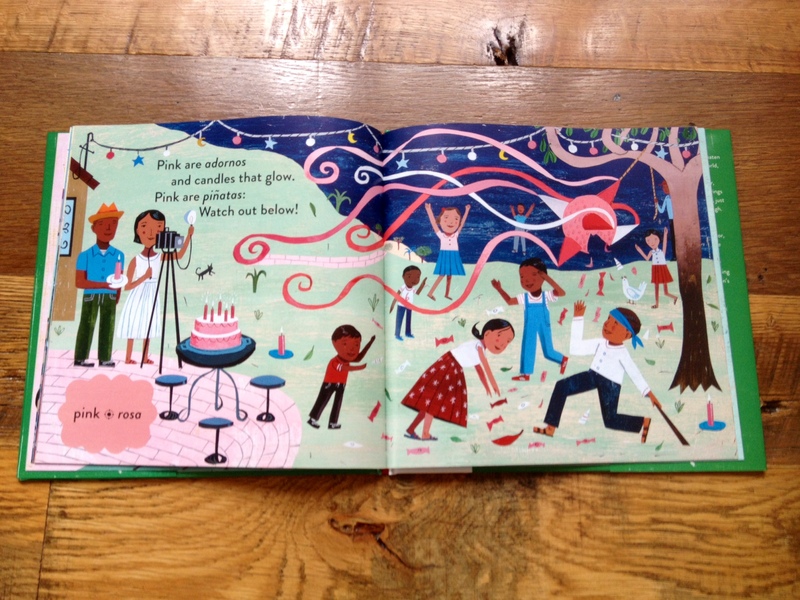 What do illustrators always wish they could ask authors? I guess my biggest question is – How difficult is it to see your words visually interpreted by a stranger? Is it weird to see characters look different than you imagined when you were writing the story? When I first started writing this was difficult for me (in all my imaginary books). 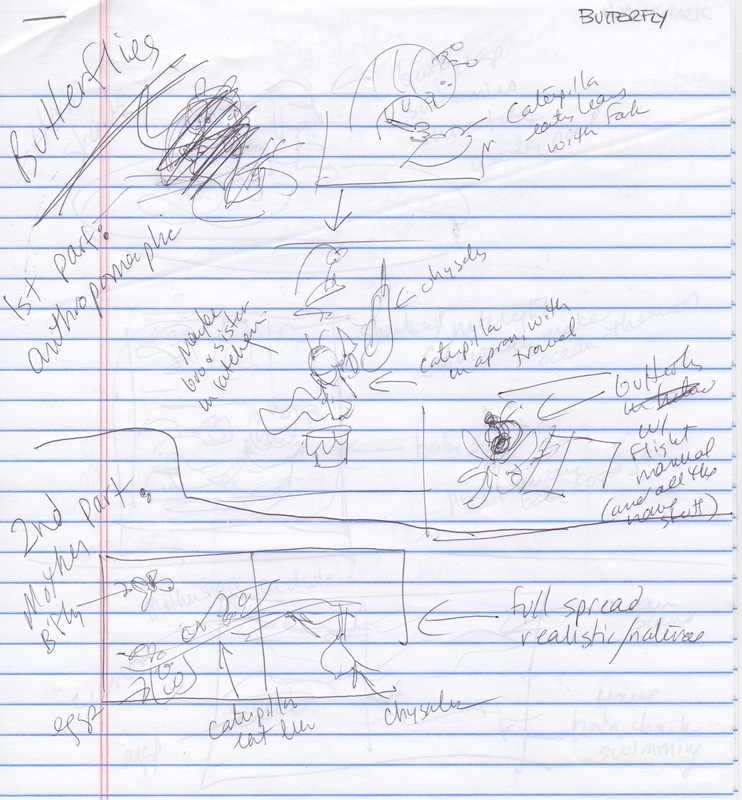 I used to put ALL sorts of illustrator notes in my manuscripts. I can’t tell you when I stopped feeling this way… it just happened. I did imagine the visual rhythm in THEY JUST KNOW, but I decided that if I controlled the verbal rhythm in the manuscript well enough, that my vision might become yours. And it did! I guess the follow up would be – Have you ever been completely surprised by the direction an illustrator took? Pleasantly or otherwise? Yes! I just got to see the cover for my upcoming middle grade novel and I was VERY surprised. The book is about three kids that get into a midnight war with some stinky trike-riding skunks and an army of vicious raccoons (who did you think played on your neighborhood playground all night?). Anyway, the cover doesn’t [TOP SECRET – INFORMATION REDACTED] and the snarly raccoons on the cover? They’re [TOP SECRET – INFORMATION REDACTED]. Those were surprises, but to me they were wonderful ones. It was like the artist peeked into me, not just into the book, to create that cover! We are doing a reveal soon on the Teen Librarian Toolbox blog… I’ll keep you posted! How do you decide what you want to write about, and the point of view you’re going to take? I ask because my dream is to one day write (and illustrate) a story of my own, but when it comes to the actual writing part I get overwhelmed by all the narrative possibilities. First person, third person, memoir, chapters, picture book, first reader, young adult. Oooh! What kind of book do you dream of?? Tell me later! I don’t always consciously decide how I’m going to tell my story. The first thing that comes is a FEELING. I hear a kid say something, or I say something to a kid, and suddenly I can feel this quiet space between words and the story starts to become something real in my mind. THEY JUST KNOW started when my grandmother and daughter were pretending to be a mother and baby butterfly. I said, “Did you know, butterflies never meet their mothers?” My daughter’s eyes went wide, my grandmother made a different sort of face, maybe because I’d spoiled their fun game, and then there was quiet. My daughter waited expectantly for me to explain my audacious claim. That waiting, that wanting to know, is where I think my stories start. I do often explore different points of view and formats, but usually in a revision. When I’m writing I don’t worry about that stuff. Not to mention, my bigger/biggest problem is – all the subjects that fascinate me. I have notebooks full of plot ideas and character descriptions, even snippets of dialogue, but then can never narrow down my topic. What calls to you first? The subject? The story? The style? I knew I had to reign myself in, so I decided to write only about spiders that lived in the Sonoran Desert, but then I thought, WHAT ABOUT ALL THE OTHER SONORAN ANIMALS, HUH??? So I had to put them in too and what began as a book about spiders has become a web of interacting poems about snakes and storms and pronghorn and javelina and a few spiders too. And of course – Do you have a dream project you haven’t tackled yet? Thanks so much for answering my questions and for asking such amazing ones. I can’t wait until our book gets out there! 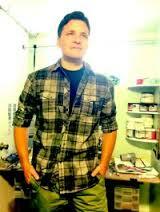 I’m so pleased to welcome Greg Pizzoli to the Nonficiton Nook! Greg is the Geisel Award winning author and illustrator of funny, spectacularly designed, and visually stunning picture books for very young readers. 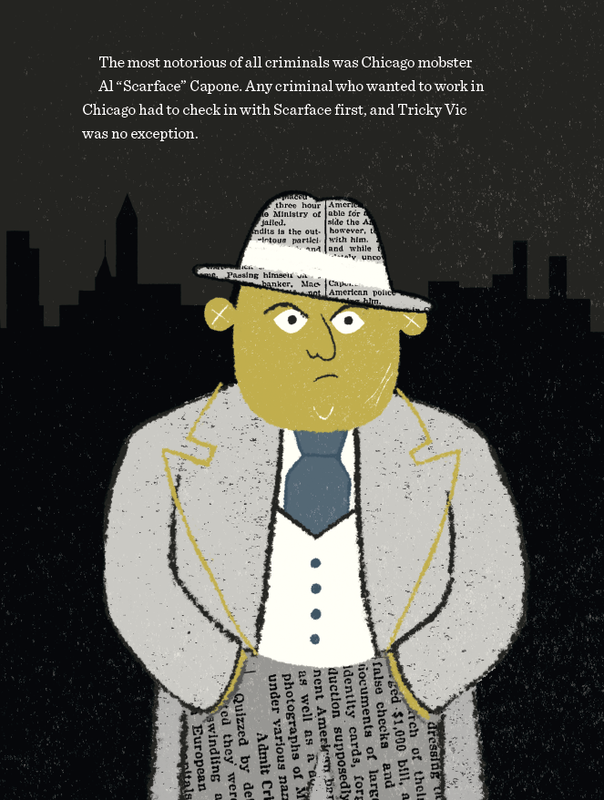 His first non-fiction picture book, TRICKY VIC, is as slick as his con-artist protagonist. In TRICKY VIC Robert Miller, AKA “Count Victor Lustig,” uses a string of aliases across the world, sells the Eiffel Tower for scrap metal in France, and even cons the infamous Al Capone in Chicago. The sly humor, stunning design, and real world villainy of Robert Miller in TRICKY VIC is sure to thrill young readers. After reading my interview with Greg, if you still need more convincing, you can sneak a peek at my goodreads review. But if you’ve already been conned, simply add a comment to the interview post to enter to win one of two signed copies of Tricky Vic! 1. Hi Greg! Does your interest in conmen go back to your own childhood? Did you know about Robert Miller before you began to research this book, or did you go hunting for the perfect conman character? Great question! Like most kids, I was really into the idea of getting away with things. Although I don’t know if I ever even heard the term “con-artist” until high school. But I was always super interested in books that catalogued people like Al Capone, John Dillinger, etc. with a photo and maybe a paragraph about their worst crimes. I ate those up. I first heard about “Count Victor Lustig” in 2008 or 2009 while in graduate school. I went hunting for nonfiction stories because it seemed like a different kind of challenge than the work I was doing at the time. It took another three years or so and lots of luck before I conned Viking into publishing it. I didn’t find out his real name was Robert Miller until I started researching the book in earnest in 2013. 2. 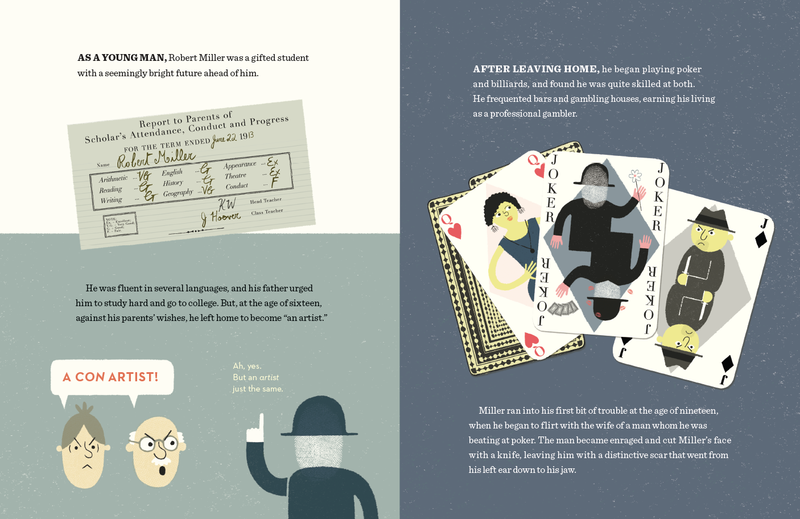 Did you learn anything interesting about Robert Miller that didn’t make it into the book. I’m asking for the grownups in the room. Don’t hold out on us! The best stuff is in the book! We did very little sanitizing to make the book more “kid-friendly” – a term I despise – and we didn’t hide any of the good stuff. That being said, some stuff didn’t make it into the book either because the cons weren’t quite as dramatic or the pay-off wasn’t that great. One of the cons we cut was a “trick” where Miller convinced a banker he wanted to buy a bank-owned farm, and through literal sleight-of-hand, switched some envelopes in the banker’s office and walked out with $10,000. That’s impressive to be sure, but it doesn’t showcase the same kind of ingenuity he displayed in his other cons. I will say that there is a secret* in the book for anyone interested enough to hunt a bit. I think of it as a nice surprise for the readers who really devour the book and want to see Miller from all angles. *This is a part of the secret brilliance of Greg’s illustration. The pictures can be read just as deeply as the words. I love the spread (shown below) that illustrates the knife fight, because it displays how the book balances the inclusion of real and uncensored details with interesting (but not gruesome) illustrations. 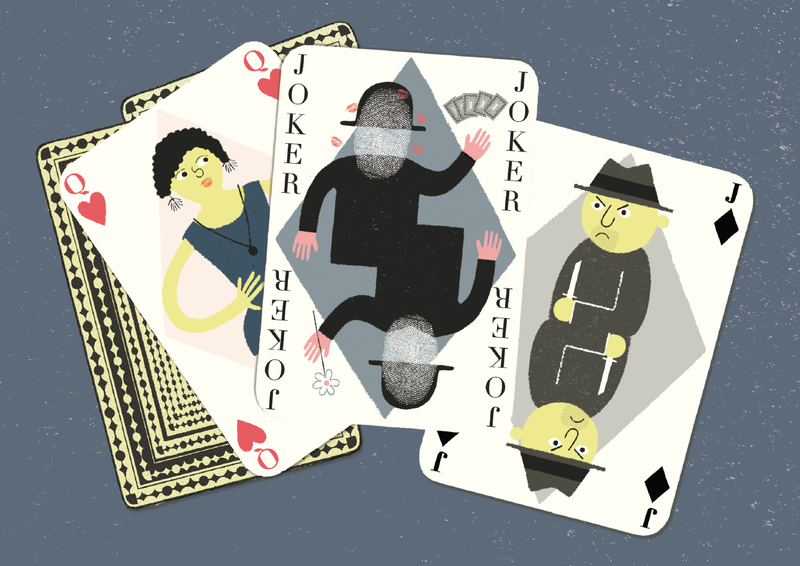 I think it’s great that you picked out the playing card image as a favorite – it’s one of my favorites, too. I had a lot of fun sneaking small details into this book and I think that image in particular speaks to that – for example, Vic as the “joker” card is pretty obvious maybe, but then having the queen be the woman he’s wooing over the poker table, and the jack being the man who slashed his face. Vic’s holding flowers towards the queen and cards towards the jack. Maybe it’s obvious to some people, maybe some people won’t even notice it, but adding little details makes it a lot more fun for me. Oh! And the lipstick on Vic’s card, too, that’s another example. 3. TRICKY VIC strikes me as the kind of book that kids will pass around among themselves, whisper about, maybe even hide (while we all watch them sideways and smile). Do remember any books like this from your childhood? I love this question! It would be great if readers thought that reading this book meant that they were getting away with something. But I have to be honest – while I do remember CDs and video games (with profanity or violence) getting passed around as you describe – I don’t remember any books that weren’t fair game. 4. I think school visits with this book are going to be a lot of fun! Do you have anything tricky up your sleeve? Will you be teaching confidence tricks, sleight of hand, making up aliases? All of those things! Kids are all (or, ok, mostly) natural cons and tricksters anyway, and it will be fun to engage with them in a way that encourages those tendencies – and maybe help kindle some interest in nonfiction that’s different from what they typically see or read. 5. I know you have another nonfiction title in the works, about a jungle explorer—can you tell me anything interesting about that? Like does anyone get eaten by a jaguar, laid up with a mysterious jungle fever, or get lost FOREVER? Yes! Thanks! I don’t want to give too much away – but yes, another book is in the works – and it’s about an explorer – there are jaguars, anacondas, and cannibals – I’m working on it now and it will hit shelves later next year. Voila. There you have it folks. Tricky Vic & the brilliant con-artist Greg Pizzoli! Readers who want to know even more about Greg’s process for creating TRICKY VIC can sneak on over to the Seven Impossible Things blog. Greg says, “My dream for this book—besides, ya know, ten million copies sold—is that some kid who maybe is dreading yet another book report on a goody-goody President “who never told a lie” can pick up Tricky Vic and write a biography of the man who conned Al Capone.” I’m pretty sure this book is going to make Greg’s dream come true in spades (because they are cleverly hidden up his own sleeve). If you want to win one of two signed copies of TRICKY VIC just add a comment to the interview below. I’ll announce the lucky marks on March 10, 2015. 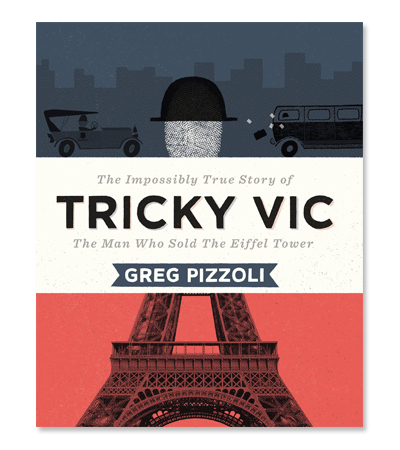 Next month I’ll bring you an interview with Greg Pizzoli on his new book, TRICKY VIC. It’s about a mysterious conman who invented over forty-five different aliases, sold the Eiffel tower, and even tricked the notorious mobster Al Capone! What will come after that? Even I don’t know. But I’m excited to find a new book that’s thrilling, impeccably designed, and uniquely illustrated and I bet kid readers will be too! BLUE ON BLUE is a thing of beauty! Dianne’s graceful and spare poem of a stormy day is the like the sound of rain on a roof, rhythmic, comforting, and thrilling. 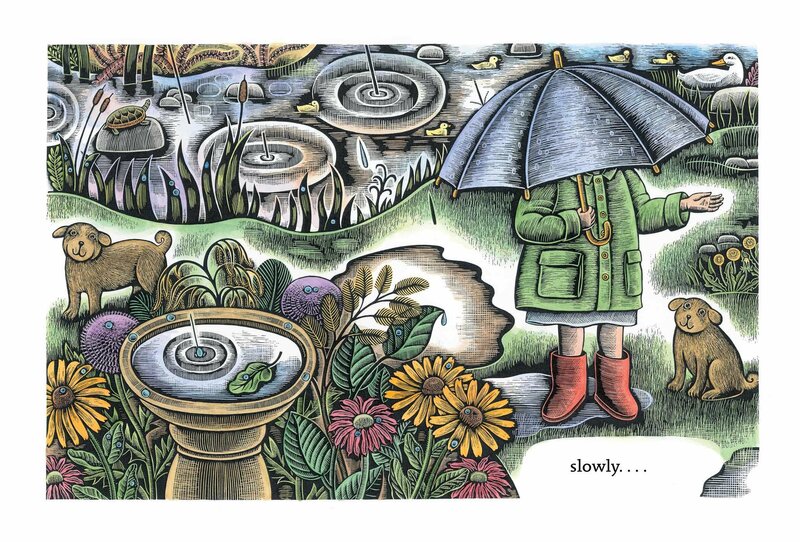 Beth’s visual world is the earth on which that rain falls. 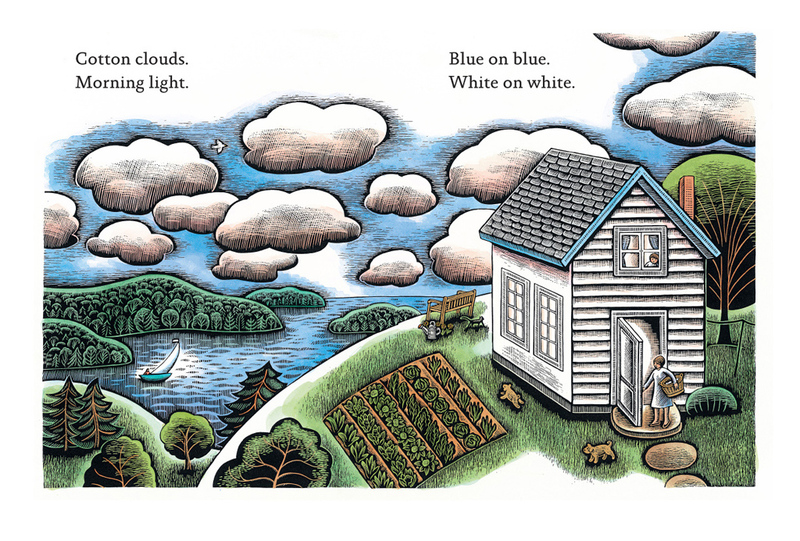 The book, pictures and words together, is a house, a cozy world where family, childhood, and home are connected with the wonder of the natural world. 1. 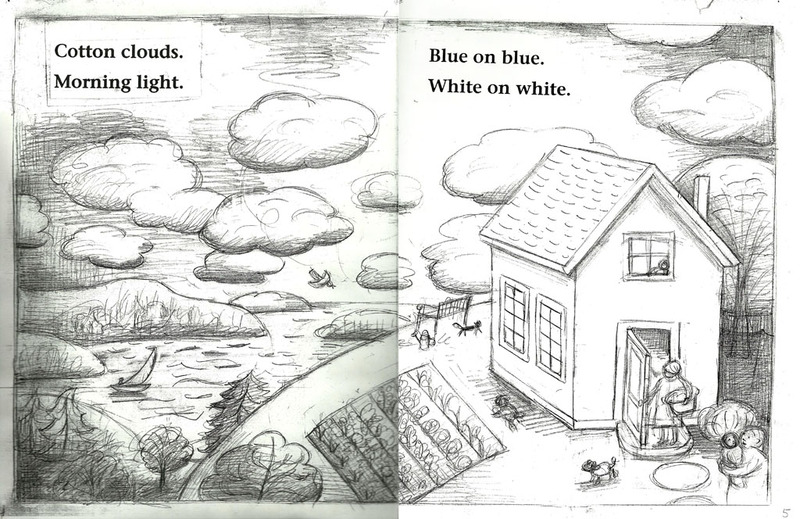 Dianne, your perfect little poem only gives the slightest hint of the child’s story in the words “Singing, swinging outdoor play,” but I imagine you had your own visual story of the child’s rainy day. I wonder how much of that you shared with the publisher and how much of what you imagined, but didn’t share, made it, magically, into Beth’s intricate art? When I write, I often do have some sort of vague image possibilities floating in my head. 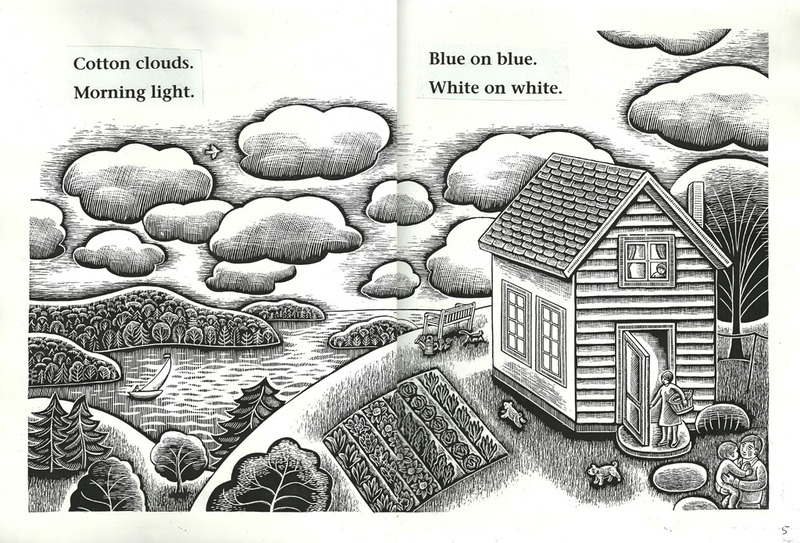 But in the case of BLUE on BLUE, I don’t recall giving much thought to it because the story came quickly and in its entirety. As such, it wasn’t a manuscript I labored over in the way that I have most others. 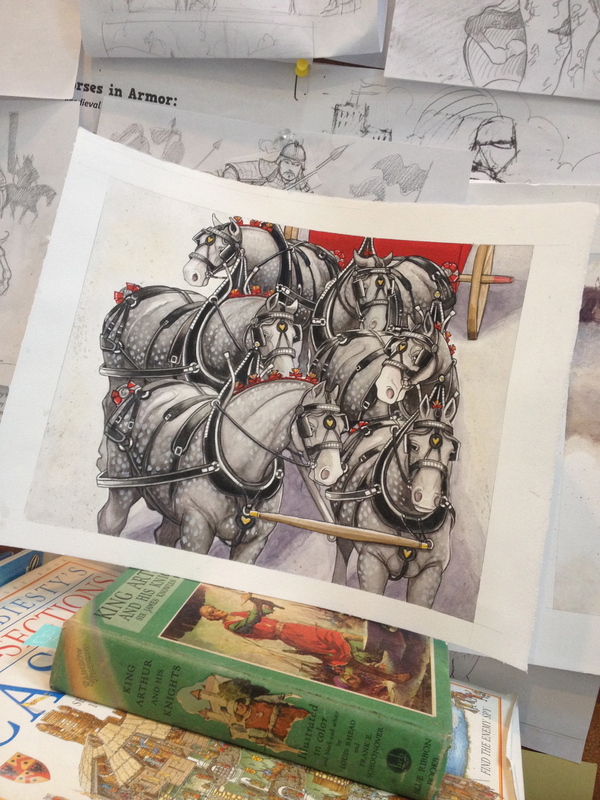 In one of my first classes in writing for children years ago, I was told that the author’s job, once a book has been acquired, is to step aside and let the illustrator bring her vision and narrative to the text, and the editor, her wealth of knowledge and experience. So when I got the news that Allyn Johnston of Beach Lane Books wanted to acquire the book, and Beth Krommes would illustrate, I was over the moon. 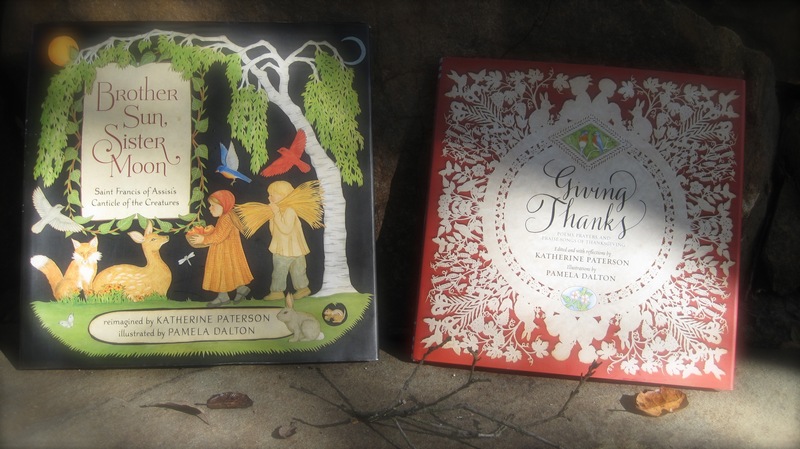 I’d greatly admired the books Allyn had published over the years and I’d been a fan of Beth’s work since I first encountered it in her illustrations of Phyllis Root’s, Grandmother Winter. I knew, on all counts, that BLUE on BLUE had been placed in the very best of hands. But to answer your question directly – No, I didn’t share thoughts on illustrations. 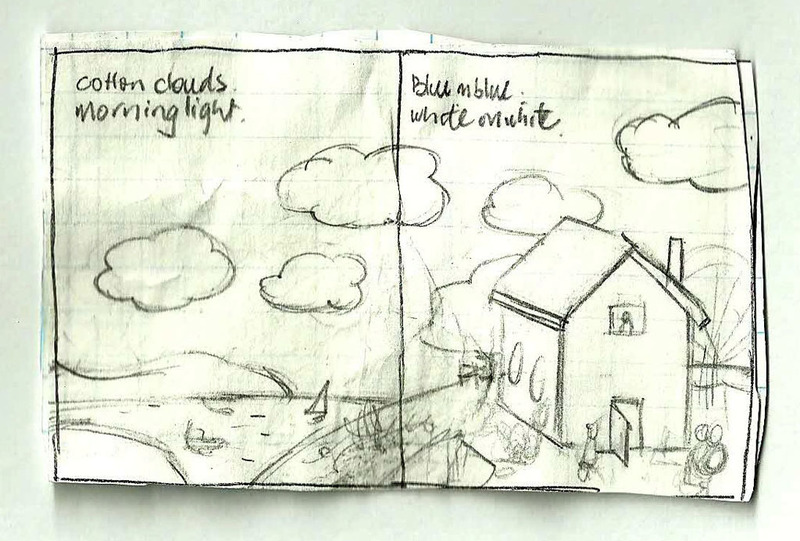 Beth was kind enough to share the initial sketches/dummy of the book once she began working. And of course, they were as wonderful as I knew they would be! But when I saw the final images – ohhh! They were glorious. And the colors! All of my favorites. It was like receiving a most beautiful and exquisite gift. 2. In your words there is a dance between the simple beauty of a child’s experience, of mud and outdoor play, that then expands upward to encompass a more extraordinary appreciation for the natural world. 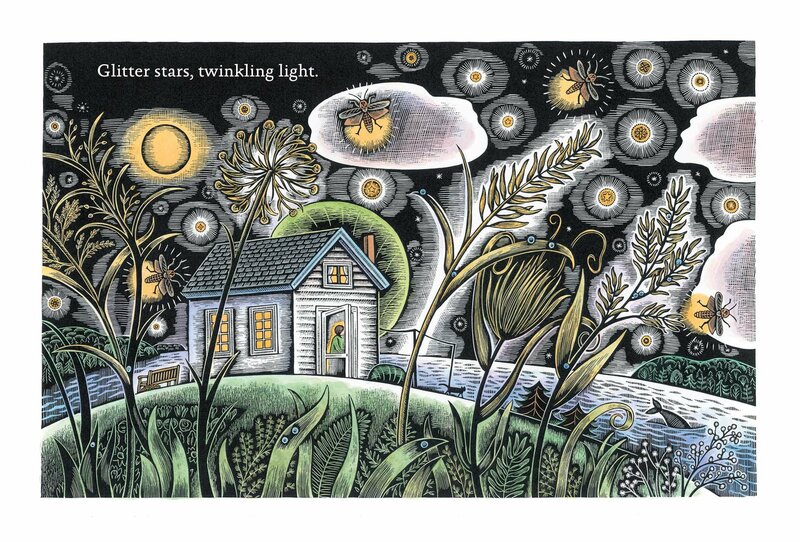 In doing that you link the mundane, earthly beauty of childhood to the twinkling of stars—something quite heavenly. I see this again and again in Beth’s work, and I’m guessing it’s one of the reasons you two were paired on this book. My question is, where do you think that comes from? From where inside you does that spring? That’s a fascinating observation, and it makes me very happy to know that the connection between the ordinary, mundane things of life with the extraordinary beauty of our world comes across in both words and illustrations. It wasn’t by conscious intention on my part, but it’s something I find myself more and more fascinated by – how amazing our world is and how important it is to pay attention to “small moments” and even smaller things. 3. Would you please share a favorite rainy day memory from your childhood? One of my favorite memories is of the sound of the rain pounding on the corrugated roof over the indoor garden of our family’s home in the Philippines. It was loud and exciting, and echoed throughout the entire house! More recently, in Arizona, we’ve experienced pounding, hounding, noisy-sounding thunderstorms such as we’d never known for all the years we spent in Southern California. These sudden bursts blow over fairly quickly, but I still find myself fascinated, and often stand on the patio or porch taking photos and video. 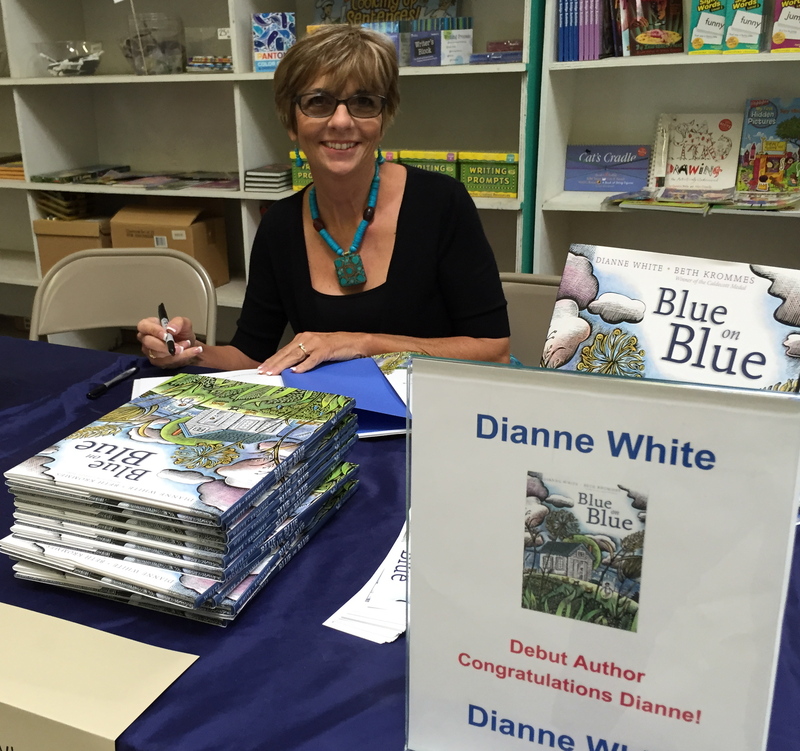 Thank you, Dianne & happy first book birthday! 1. Beth, when you read Dianne’s poem how much of the visual story came quickly, and how much was developed over a longer period? When my son and I read this book we spent time finding his favorite things: the kitties, the turtles, the tractors. Do you put those little spot illustrations in instinctively, or have you learned what children love to hunt for over the course of your career? I wrote at least six pages of notes after reading Dianne’s manuscript, dissecting every word of the text. For example, I wrote down “cotton”, then listed everything I could think of about cotton: plant, white, fluffy, shirts, sheets, white laundry on a line, etc. After analyzing each word, I wondered who needs to watch the weather? Pilots, sailors, farmers. I thought about what kind of animals might react in advance to a storm. Dogs, birds, horses, among others. Who likes to play in the mud? Children, dogs, ducks, pigs. Who doesn’t like mud? Parents, farmers. I thought about everything to do with water: the journey from rain to sea, sheets of rain, ocean, river, stream, raindrops, faucet, tub, pitcher, baptism, bathing, drinking, cooking, cleaning, reflections, etc. After tons of brainstorming, the characters and setting started to come into focus for me. 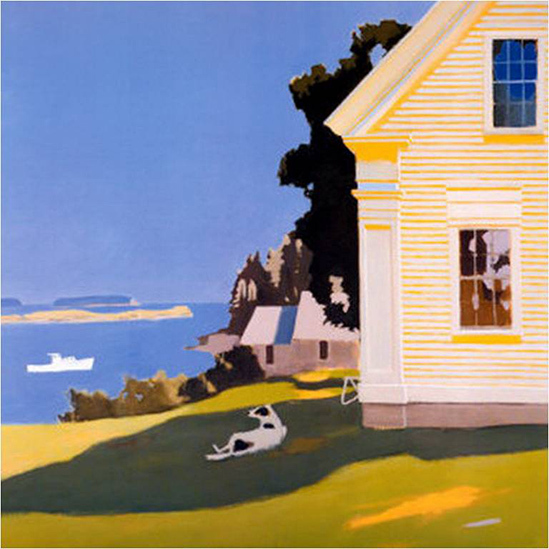 I looked at the work of two of my favorite artists for inspiration: Fairfield Porter, especially his painting “Island Farmhouse”, and Grant Wood for his painting “Spring Turning”. I’ve been told many times by parents that their children love to hunt for things in my pictures, so I always include lots of fun details, especially animals. I’m not sure where that comes from. I’m from a Lutheran family and have attended church for most of my life. I love to ponder the beauty and mystery of the world. I’m also an art lover. 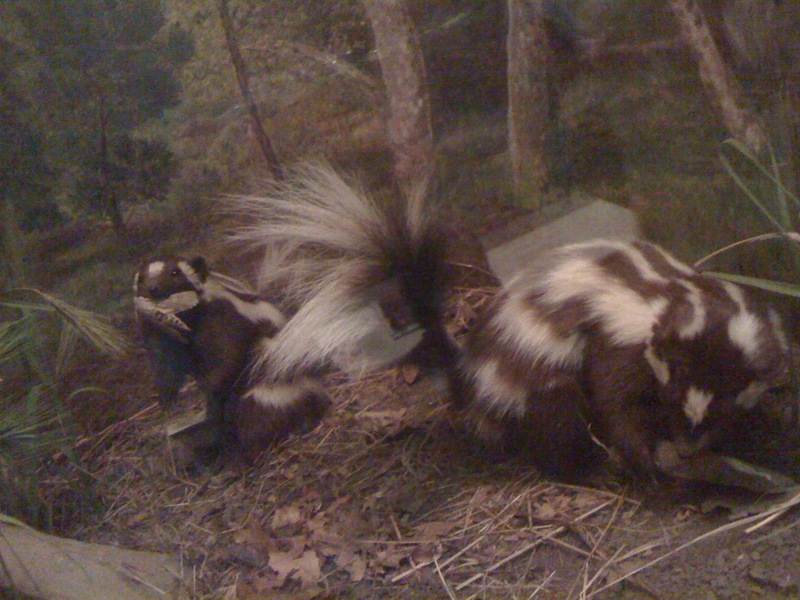 Museums are holy places to me. I have many cozy memories of watching rainstorms from a safe place indoors, such as through a screen door. My best mud memory, though, is when my friend Ann lost one of her brand new penny loafers the day before fifth grade started, when we climbed a huge mud mountain in the construction site behind her house. That shoe was sucked right off her foot, never to be found again. It was the darndest thing. Beth was kind enough to send along some process pictures which show the transformation from tiny thumbnails, to finished sketches, to scratchboard, to the final full-color art! 1. Hi, Pamela! What do you think kids would love to know about you? I would say, that the pictures of BROTHER SUN, SISTER MOON are not a whole lot unlike where I live. I’m way out in the country. I live in an amazing community. We do a lot of things the old timey way. The bread oven and the section on fire, stands right across the road from my house. There is a big dairy barn with forty-some beautiful brown Swiss cows, also directly across from the house. Yeah… and we have our wood stoves, and we all have our gardens, and all walk in the woods, and it’s just like the picture book! 2. I have the new book, GIVING THANKS. It’s really different, from BROTHER SUN, SISTER MOON. How do you decide what you want a book to look like? That was really the vision of my editor, Christopher Franceschelli. He really wanted to do a book of prayers and graces, with the theme of gratitude. He envisioned using the color instead of the black, he envisioned the white on white, stuff that I would probably never do in a million years, but I’m thrilled with how it turned out. Especially the white on white! (It looks, to me, like a tablecloth.) Yeah, It just looks very elegant to me! 3. Do you have a favorite piece in the book? My favorite prayer is the Albert Schweitzer, and my favorite image is the little sitting mouse that goes with that, or in that section. 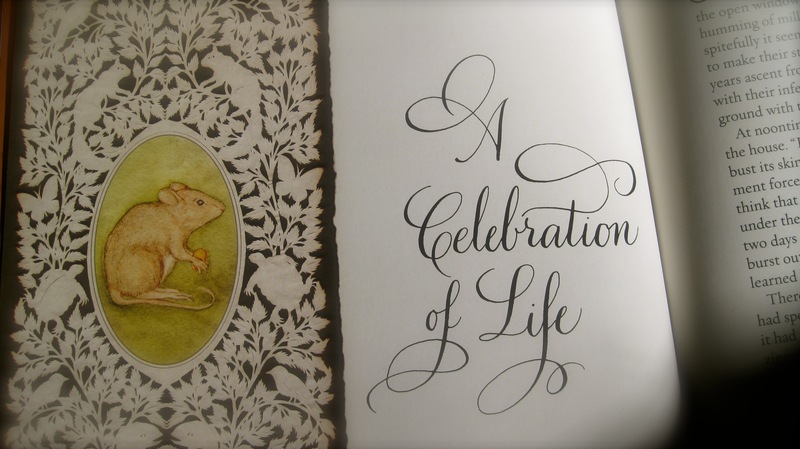 I just have an infinite love for animals, and I really loved painting that little mouse! I just felt so good painting that little mouse and I think that particular prayer is so meaningful and so precious to me. I wanted to give it an exclamation! Well, here it is: O heavenly Father, protect and bless all things that have breath: guard them from all evil, and let them sleep in peace. 4. When you were little did you make cut paper dolls and snowflakes or was that something you learned to do as an adult? I made a lot of snowflakes! I think you should make a book about snow! That would be beautiful. Jeannie Brett is in the Nook today answering questions about her newest book! 1. Hi Jeannie! I had no idea there were only eight bear species on Earth! They are all amazing, but I have to ask… do you have a favorite bear species? Ah, yes. I have been fascinated by the Spectacled bear for years! They are especially appealing with their facial markings that look like spectacles. You know, a bear wearing glasses! Someday I would love to visit the cloud forests of Peru and imagine that I spy a spectacled bear in its crudely made nest, way up in a tree munching on bromeliads. Most likely I wouldn’t see one because they are very shy and there are few left in the wild. But I can imagine! 2. 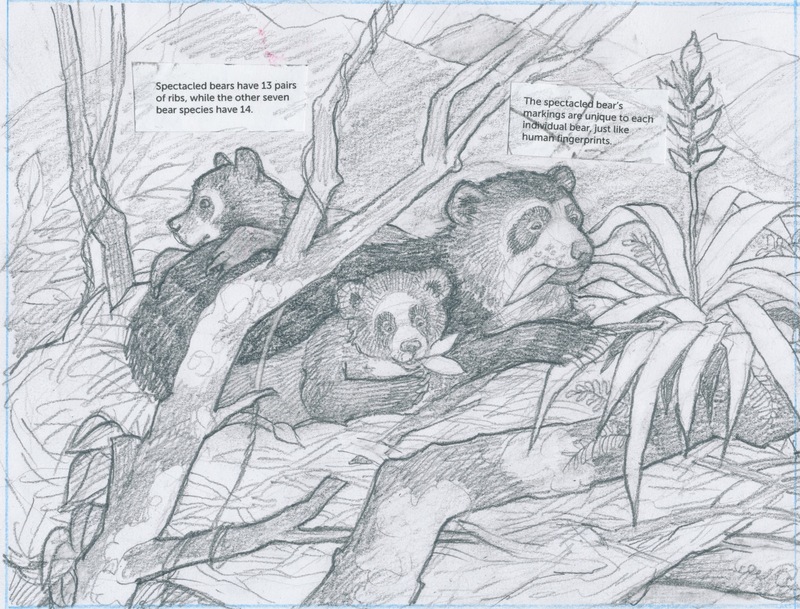 You wrote AND illustrated WILD ABOUT BEARS, which makes me wonder: did you create bear sketches and paintings first or do your research and writing first? I created rough sketches and also some detailed art when I worked on the concept of the book along with a bit of writing from my first batch of research information. The book went through many changes before becoming what it is today. It was a long process both with the illustrations, the research and editing. So to answer your question…I worked on both, back and forth. 3. 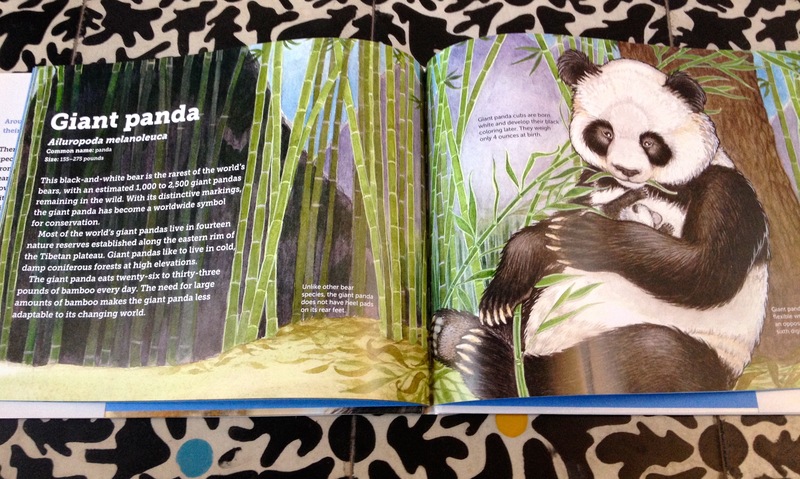 When I got your book I was still under the impression that Panda Bears were not ‘true bears’ and I had to do a little research to confirm. I love how quickly science can change human understanding! Did you learn anything while researching that surprised YOU? YES! I found that there was a lot of conflicting information about bears. I was lucky to meet a bear conservation expert and the executive director of Great Bear Foundation (a non-profit organization dedicated to the conservation of the eight species of bears and their habitat around the world). She graciously was willing to check my bear facts. It was incredibly helpful to have people in the know check my facts AND my illustrations! My publisher, Charlesbridge Publishing also does a thorough job fact checking. 4. 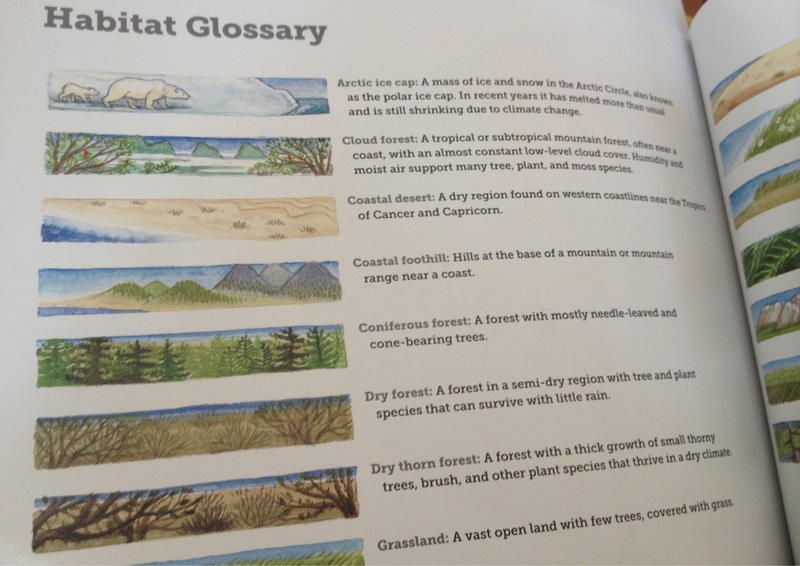 I LOVE your illustrated habitat index in the back of the book. Where did that idea come from? 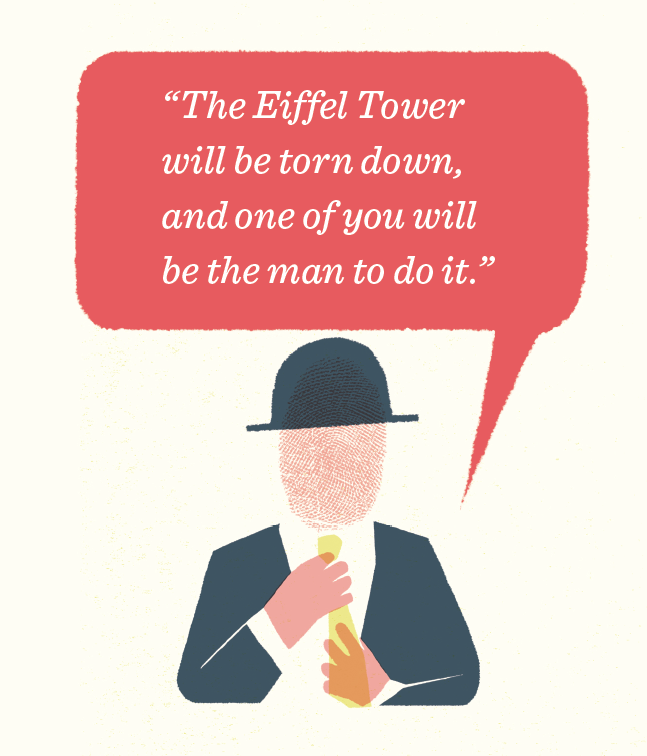 Being a visual thinker I have always been a fan of illustrated glossaries. Originally I had a glossary filled with flora and fauna of the different bear habitats. It was a bit much. I tend to get carried away with detail. 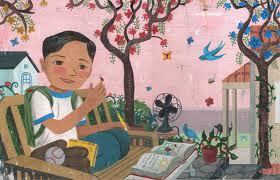 I do think it’s a great way for kids to get more information from a book and have a springboard to other research. My son was a reader of non-fiction when he was in elementary school. I think he would have loved the glossary in Wild About Bears when he was a boy. 5. What do kids ALWAYS want to know when you do school visits? First of all, I LOVE visiting schools! It’s a wonderful opportunity to connect with the kids that read my books. Sharing my books, art and love for nature and animals is a thrill for me. I always learn something new from the students as well. What do kids ask? They always ask if I will draw for them. “You bet!” is my answer. 6. 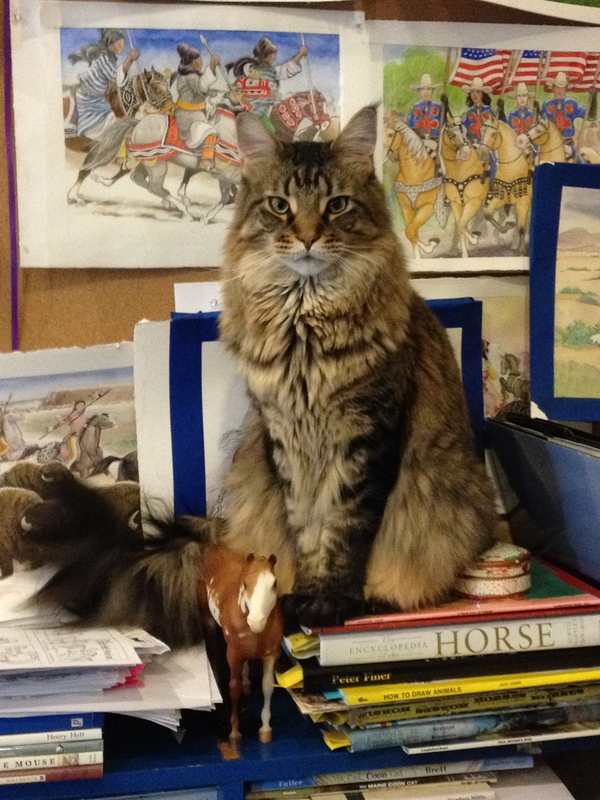 I know you are doing a book on decorated horses next — can you give us a peek? Yes! Decorated Horses will make its debut in the spring of 2015. The wonderful Dorothy Hinshaw Patent is the author. I finished the illustrations in late spring of 2014. I can’t wait to see it in printed book form. I loved drawing horses as a child and I still do. 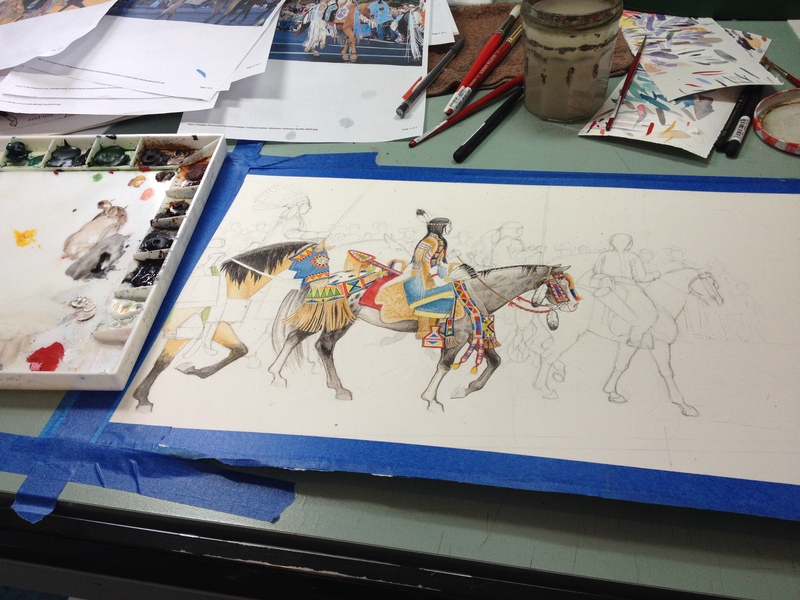 I spent a lot of time researching for my illustrations, sketching and re-sketching, and then on to the final art in watercolor on 300 lb. hot press paper. 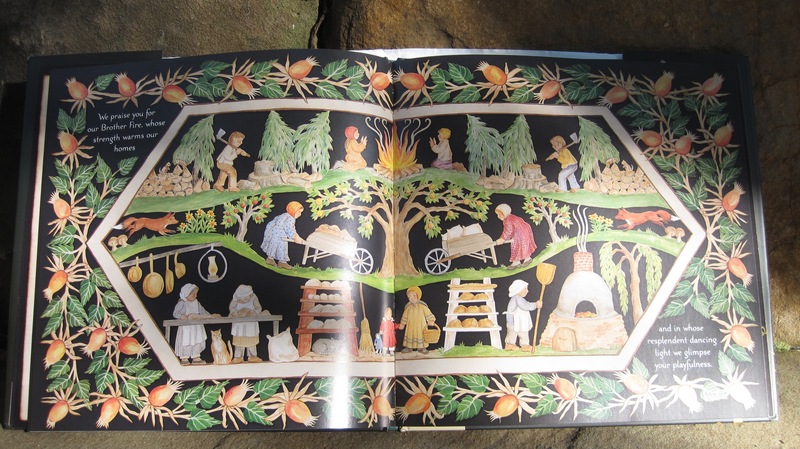 I love that this book includes many cultures, places and different ages in history. 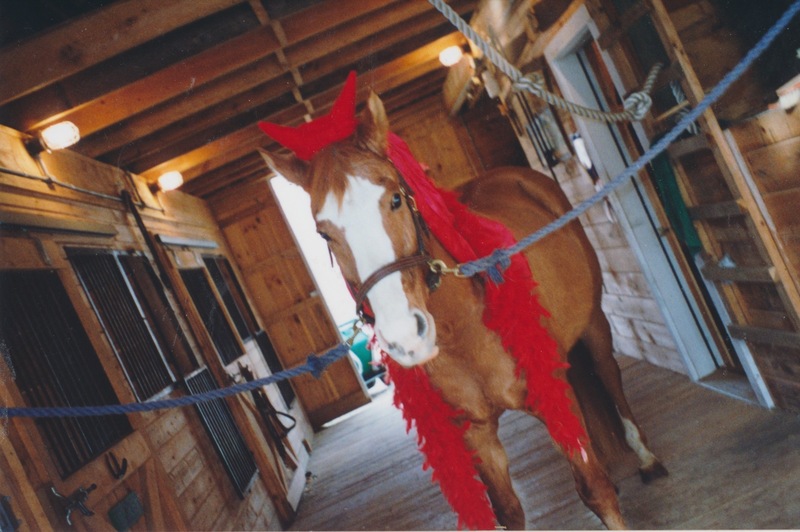 Our beloved horse Bailey served as inspiration! In fact, my dedication in the book is to Bailey. Thank you for all the wonderful words and images, Jeannie! To learn more about Jeannie and her books you can visit her website, Facebook and twitter! 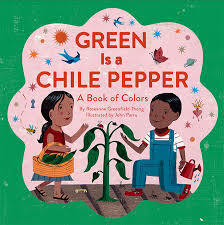 To celebrate my interview with illustrator John Parra I’m giving away a signed copy of his newest book, GREEN IS A CHILE PEPPER. I am such a sucker for color concept books and this one is MAGIC! It is beautiful, it has heart, and it invites readers to SEE the world, to look, to feel, to listen, to smell, to taste, and to have fun! Roseanne Greenfield Thong’s simple verse is sprinkled with Spanish, which absolutely enriches the experience of reading this book. 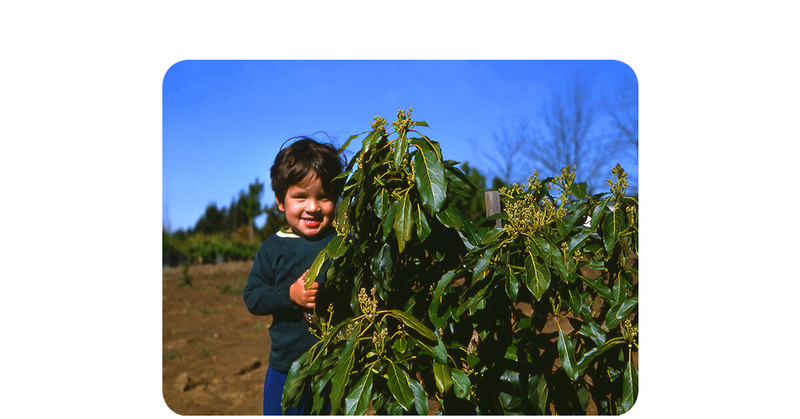 GREEN IS A CHILE PEPPER will call to all your senses and will be wonderful to share in a classroom, a library, or on a lap. John Parra is an award winning illustrator best known for his illustrated Latino themed children’s books, Gracias / Thanks and Waiting for the Biblioburro. His books have won him The Golden Kite Award from The Society of Children’s Book Writers and Illustrators, and The Pura Belpré Honor’s Award from The American Library Association. I first picked his books up at the SCBWI Summer Conference. 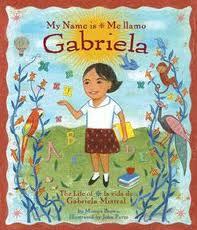 I kinda fell in love with his art–I bought GRACIAS/THANKS and MY NAME IS GABRIELA. I knew John would be signing books at the autograph party at the end of the conference, but I wasn’t going to be able to stay. So even though I don’t illustrate my books I went to one of his workshops. He talked about his inspiration and his illustration process. He shared cool pictures from his childhood. It was one of those great moments in life when you KNOW you are in the right place, doing the right thing, and you KNOW why something affected you the way it did. About two minutes into the workshop he started talking about one of the biggest influences on his art: growing up in Santa Barbara. He shared pictures of Old Spanish Days, Piñatas, and lights strung from trees. 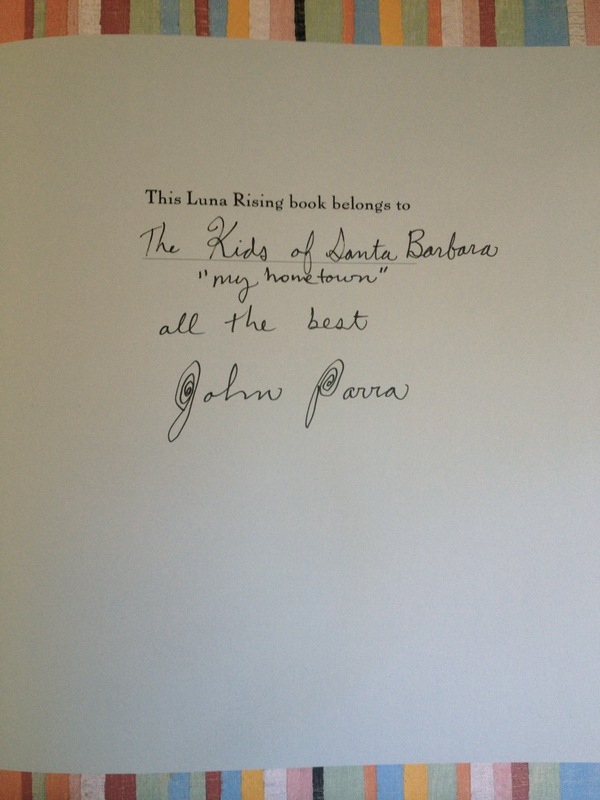 Santa Barbara is my city, you guys. It is color. It is home. It inspires me too. After his presentation I chatted John up and got him to sign some books for my students in Santa Barbara (back then I was teaching elementary school). Now, whenever I go into schools to teach writing I still share them. He was incredibly encouraging to me, as a writer. 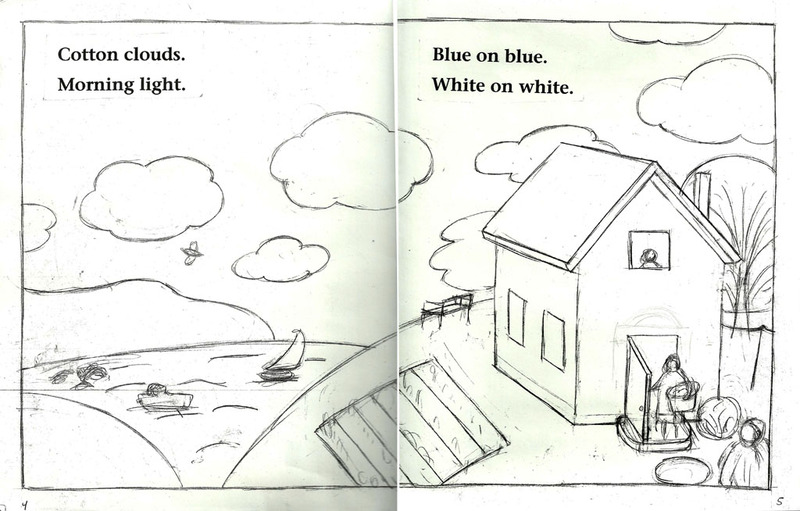 Since then I’ve sold my first picture book manuscript and hope there will be many more to come. 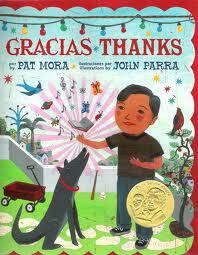 I think the SCBWI and John Parra had a little bit to do with my process, my inspiration, and my success. So, gracias/thanks and welcome, John! ROBIN: Well, I have a bunch of your books, not just Green is a Chile Pepper and what I love about all of them is the visual peek you give inside the characters, not just into their bustling lives and houses and families, but into their busy minds and hearts. 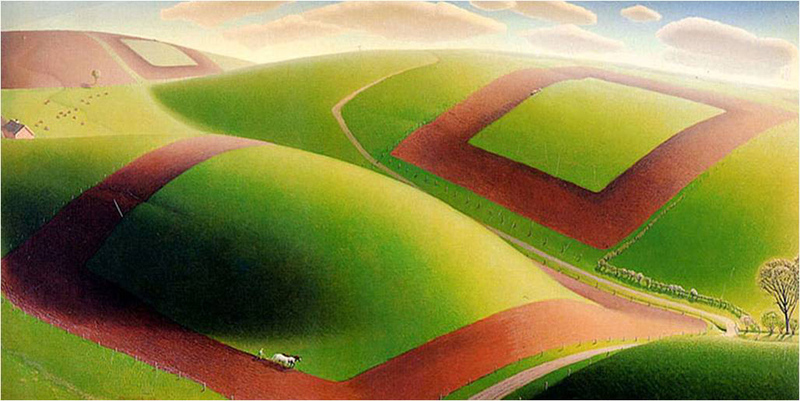 All your spreads are jam packed with details and they make me wonder, when you create your art is it like a story? Do you know where everyone is going and why all those little details are there? ROBIN: When you go into schools what do kids always ask you about this book (or about your art in general), and what do you love telling them that they never ask? JOHN: The most frequent question I get is: “Where do your ideas come from?” I gladly tell them that many ideas for my art come from my family, music, food, travel, museums, paintings, gardens, people watching, hiking, old movies, animals, and nature, but one of the most important influences comes from reading, because reading always inspires me to think visually and creatively. It is a successful recipe for creating good art and ideas. 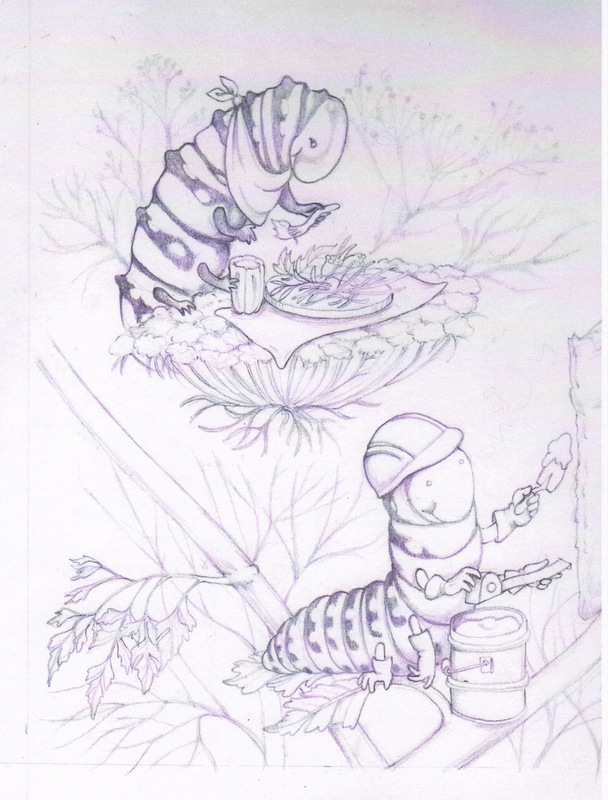 The question I don’t usually get asked, that I think is important, is: “How long does it take to create the art for a children’s book?” to which the kids usually respond “TWO DAYS!” or there about. They are always a little shocked when I tell them it’s closer to seven to nine months of hard work in my studio. ROBIN: This book is about color, which I’m such a sucker for; when you were creating the art did you start seeing colors around you in a different way or do you always pay attention to color? JOHN: I’m not sure if I started seeing colors differently while working on Green is the Chile Pepper but I did have to approach my work in a alternate way. As an artist I tend to l use colors from a wide and diverse spectrum. Since each page in this book had a thematic color assigned to it I wanted to keep the focus as much as possible on that one color. One way to do that was to devise a very narrow color palate scheme for every spread, to complement the main color and help promote its significance. Then I searched to find items and images, associated with that color, to incorporate into the image. One example I used for inspiration regarding a color connection had to do with orange. A favorite TV episode growing up during Halloween was special titled: Peanuts: It’s the Great Pumpkin Charlie Brown. There is a scene with a field of pumpkins that I just had to incorporate in that orange, Dia de los Muertos Parade spread. Other color items ideas came from my home, journeys and research. JOHN: Green was my favorite color when I was young (still is). I would find it everywhere, in nature and at home. I use to love to use green when I drew with my big box of Crayola crayons. There was even a restaurant in Solvang, CA called Pea Soup Anderson that would specifically give kids green crayons based on their famous green pea soup. Another reason was I use to also watch a show called Super-Friends on Saturday morning and two of the superheroes I admired the most had green in their names: Green Lantern and Green Arrow. Yep, GREEN was definitely a big influence. 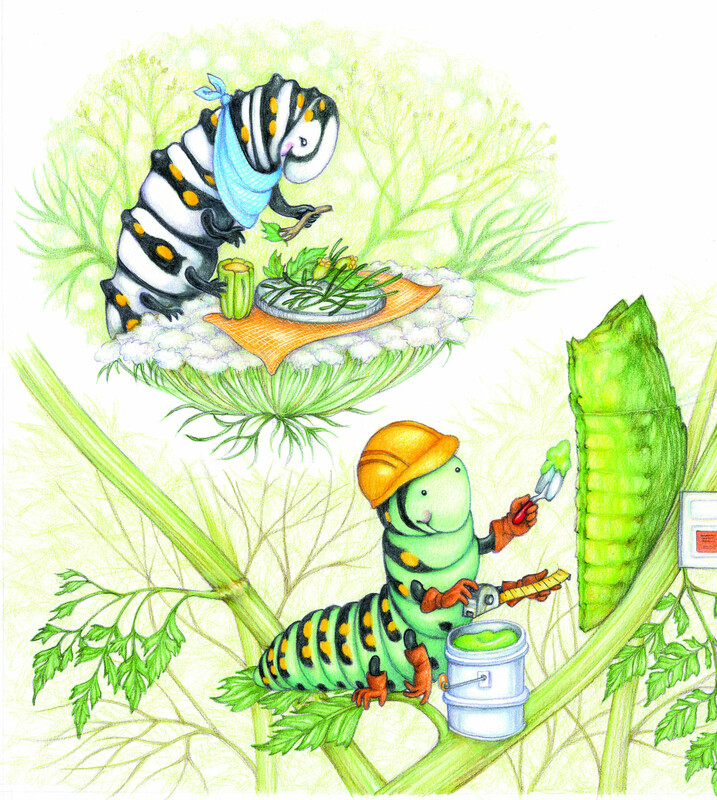 Parents & teachers interested in activities to go along with GREEN IS A CHILE PEPPER can hop over to my author site!